The following items belonging to DV Camera Hire were stolen from Black Island Studios on the 19th October 2018. Sweet TV were burgled on the night of the 11th/12th February 2019. Equipment was stolen including a ProSup Tango roller – SN 350-32317. More information will be posted here if it is made available to us but if you come across this item, please call Joe at Sweet TV. The following lenses have been reported to us as stolen. If you know of their wherabouts, please contact Xhire. We are just a little bit delighted to report that one of the most prolific sources of fraud in our industry has, courtesy of the City of London Police’s investigation, been jailed for seven and a half years. This conviction would not have happened without the information gathered and shared by X-hire members. It’s plainly and simply just great, great news. A London man was sentenced to seven and a half years on Friday 6 July 2018 at Southwark Crown Court for committing fraud by false representation after attempting to steal equipment across eight countries from nine companies working in the film industry. The case was originally taken on by the former London Regional Fraud Team and passed to the City of London Police’s Fraud Squad in March 2017. 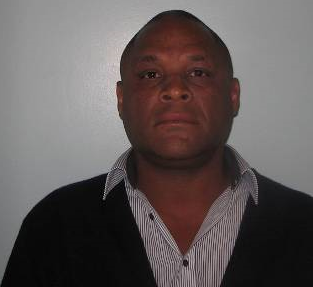 The Fraud Squad’s investigation into Michael Banfield, 36, of Buchanan Gardens, Kensal Green, London, found that he had been instrumental in taking £2.1 million worth of equipment from hire companies between June and November 2014. The complex fraud involved a network of shell companies and fraudulently using legitimate company details to obtain filming equipment which was never returned. An accomplice, Jamie Jackson, 28, of Wigram Way, Stevenage was sentenced to a 12 month suspended sentence on 5 July 2018 for his part as a courier of the equipment. Between June and December 2014, Banfield used the identities of three companies to obtain equipment from the nine victim companies. One of the company identities used in the fraud was registered as a limited company in September 2013 and dissolved in May 2015. Banfield was unsuccessful in his attempt to obtain equipment when he contacted one filming equipment hire company using this limited company’s name. The second company identity, used by Banfield between June and July 2014, was a legitimate company; its owners and staff had no part in his crimes. However, Banfield used the company’s identity and false names to contact the victim’s directly to hire equipment. A third company name, World Wide Broadcast Solutions Ltd (WWBS) was registered as a limited company in January 2014. In order to give the companies legitimacy, Banfield falsely obtained insurance documentation and provided false names using fraudulent identity documents. He also used pay as you go mobile phones without named subscribers to contact victims and used stolen bank card information. He then assisted in providing this false information to couriers and transported them to airports before they attended the victim’s premises. 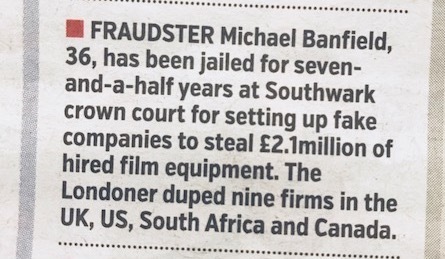 Banfield successfully collected film hire equipment from companies based in the UK, South Africa, Canada and the USA, and subsequently failed to return it. He then assisted in the attempt to sell the equipment online using the WWBS company name. At least 15 items were advertised for sale online during August 2014 and one sale is known to have been successful. The equipment taken from the victim companies has never been found. On 28 April 2015, a search was carried out at Banfield’s home address during which paperwork and mobile phones were seized. Evidence identified that a storage unit was used to store the stolen equipment, which had been set up by Banfield, using an alias to do so. A bank account in the name of this alias was registered at Banfield’s home and the telephone number linked to the bank account was attributed to Banfield. He attended a voluntary interview at Bishopsgate Police Station in the City on 11 May 2015. The accomplice, Jamie Jackson, acted as a courier for the stolen equipment in one of the offences in November 2014. Jackson was arrested and searched on 5 November 2015 at the premises of one of the victim companies where he was attempting to collect equipment on behalf of WWBS. A mobile phone was seized which contained a text message referring to the collection of the equipment and to WWBS. A business card for WWBS was also seized. Detective Constable Daniel Ward of the City of London Police’s Fraud Squad said: “The global scale of the investigation, along with the significant losses, false identification and frequent use of unregistered mobile phones by the suspects made this a complex case to investigate. Theft from Hilton Brighton Metropole Hotel. The following assets which have been stolen on Thursday Night/Friday 13th April 2018 Morning from Hilton Brighton Metropole Hotel. Contact Paul Robson on 07770 372727 if you have knowledge of the whereabouts of any of these items.